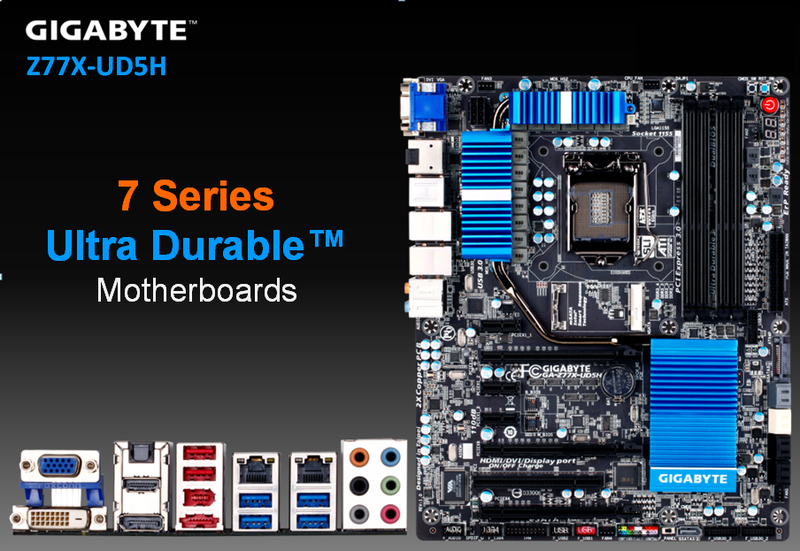 Gigabyte is kicking out some information on their upcoming lineup of 7 Series motherboards. These new boards are the 4th generation of their Ultra Durable series which has driven them to the number one spot for motherboard durability. Although not the first to get the word out about their Z77 products, Gigabyte has not actually shipped any boards to the press at this time. However, we have been fortunate enough to get some information on what features you can expect from this new generation of products from Gigabyte. At the top of the list is Gigabyte’s G1. Sniper 3. This board is compatible with Intel 2nd and 3rd generation CPUs as well as having all of the things that you have come to expect in a G1.Killer motherboard. Just under the G1.Sniper 3 we find the Z77X-UD5H WiFi. 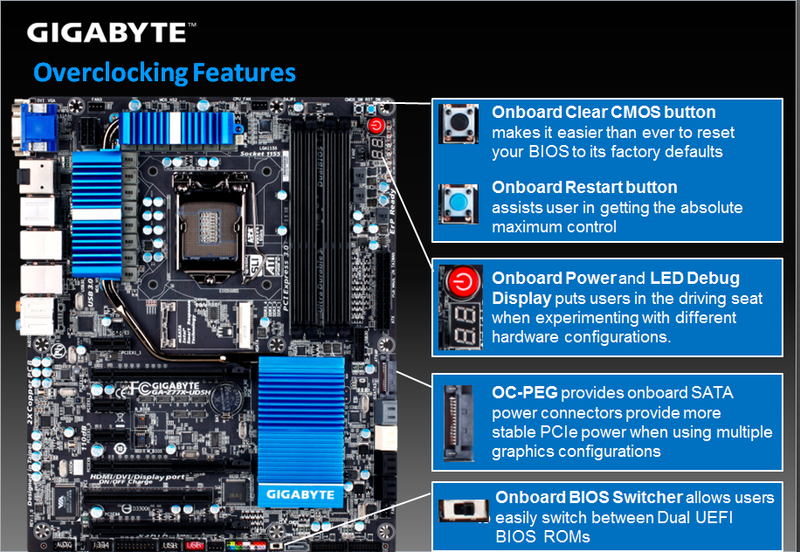 This board has some very impressive features many of which will be standard across Gigabyte’s new lineup. 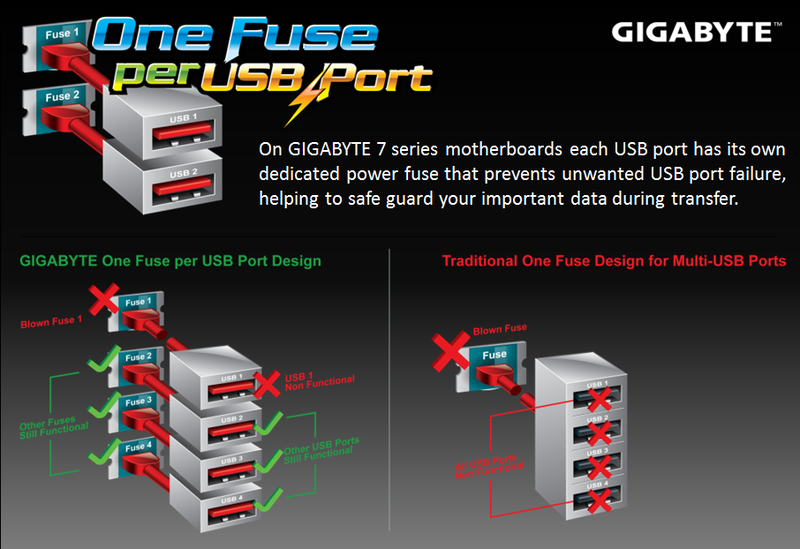 One of these (although it might not seem that impressive) is Gigabyte’s new One Fuse Per USB Port. I know what you are thinking; with everything I could talk about on a new product why the USB ports. Well one of the biggest headaches I have run into is when a mouse, Keyboard, or other powered device causes a group of USB ports to reset or “pop” their fuse. I have lost quite a bit of time re-copying files or backing data up because of things like that. This new method of fusing the ports will help to eliminate that problem. Of course there is a lot more to talk about besides the USB ports and how they are fused. SO let’s backup and take a look at some of the other items you can expect from Gigabyte and their Z77 lineup. The first thing that is different between the 6 and 7 series motherboards is the all-digital PWM. This is the first time that Gigabyte has made this move from a hybrid analog-digital system to running things fully under the digital banner. 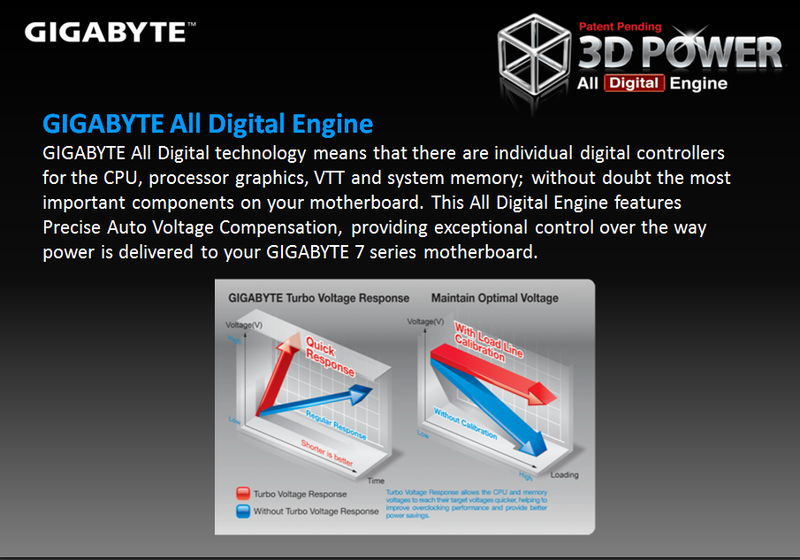 By switching to a digital power management system Gigabyte says they can offer more precise power controls and also provide individual controls and adjustments for more than just the CPU. You get controls for the CPU, On-die GPU, VTT and system memory. This is great news for overclockers (or anyone that likes to tweak their board) as you do not always want or need to push the voltage the same amount. Now it is true that you could adjust all of this before, but you ended up using the same controller, under the new system you have an independent controller for each. Gigabyte’s new Z77 lineup will also feature their 3D BIOS and Dual UEFI BIOS. From the information we have the next generation of the 3D BIOS will also have an improved UI with more information at a glance. You will still get the same advanced mode for those that like to sort through all of the settings, but for many the new 3D BIOS will be a nice change from having to tab around all the time. Gigabyte’s new Z77 line will also have full support for Generation 3 PCIe. This is great news for anyone looking to get an AMD 7 Series GPU. However, Gen3 PCie is not just for GPUs. There are a few new products (such as PCIe SSDs) that can take advantage of the almost 2x bandwidth that it theoretically available with PCIe Gen3. Speaking of graphics, the Z77X-UD5H will also have full support for Lucid’s Virtu MVP GPU Virtualization. We had the chance to check this out while at CES this year and can tell you that the MVP technology is pretty impressive even if you are only using the IGP that comes with your CPU. One of the big things that it offers is a stabilization of the frames. Sometimes when you hit high frame rates you end up with tearing or other image quality issues. With Lucid’s Virtu MVP These are removed without losing performance. Virtu MVP also has the added benefit to allow you to make the most out of the GPUs you have in your system. If something can be performed better by the IGP then Virtu MVP will allow that graphics processor to perform that task leaving the primary GPU at idle (the first version of this was shown off in 2011 at CES). Gigabyte adding this in can give you an edge that goes beyond just gaming and it can do it without increasing power draw or heat. 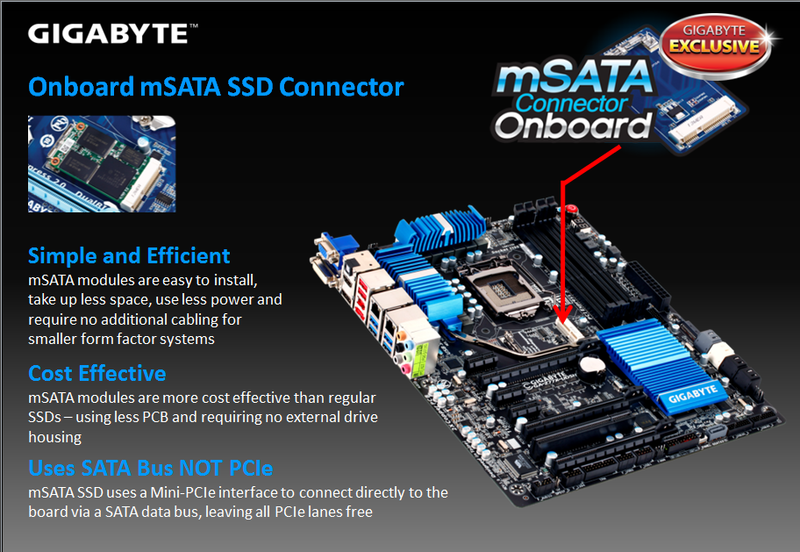 Gigabyte is also adding back in their mSATA connector onto the board so that you can throw an mSATA SSD module onto the board and setup SSD caching. The mSATA port uses a mini-PCIe interface to connect using the SATA bus. Technically this will leave PCIe lanes open (although the actual controller still uses them). We are not sure of the popularity of this type of SSD caching as the mSATA SSDs are still pretty expensive right now, but it is nice to have if you can afford it. The Z77X-UD5H WiFi will also have (gasp) a Bluetooth/WiFi Adapter similar to the ones we see with the X79 boards. The information we have is that this will be a dual band (2.4GHz/5GHz) device in addition to the Bluetooth feature. Gigabyte is also moving to using Intel for their LAN controllers. On the Z77X-UD5H you will have one Intel GBe LAN port and a Qualcomm Atheros GBe LAN port. Unfortunately this means no teaming, but it can still be a benefit to have dual LAN controllers. Although all of these features are nice (and at the compelling reasons why you but a motherboard) there is more to a motherboard (or any product for that matter) than just the features. Board performance is also dictated by the component choices made. Under Gigabyte’s Ultra Durable 4 they are providing you with the right components to make sure you have both good performance and your investment lasts. Some of these components and design choices include using more copper between the layers of the PCB; this allows better power and current flow, lower EMI, better ESD protection, and heat dissipation. The practical up shot of this one feature is longer lasting boards and the potential for solid overclocking. To help prevent moisture buildup Gigabyte has moved to a new type of material for their PCBs. Traditionally they are made of fairly typical fiberglass. 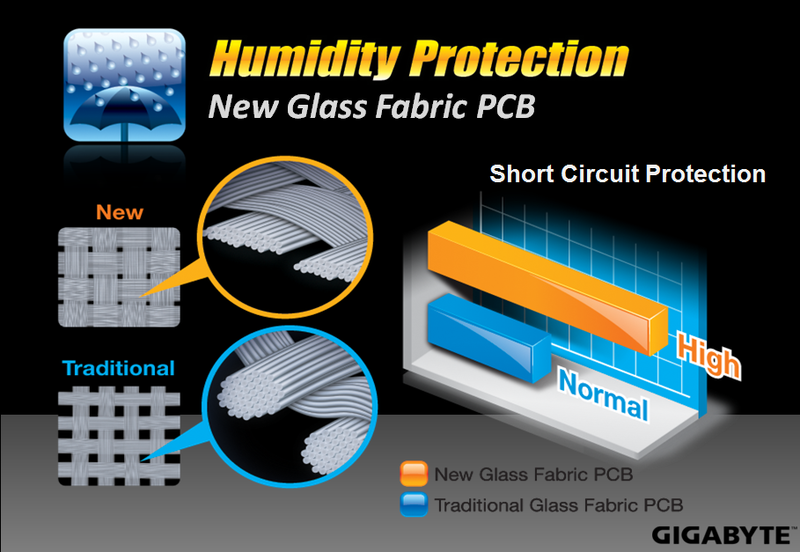 Gigabyte is using a new type of glass fabric that according to them will reduce humidity build up. Gigabyte also uses all Solid Capacitors, Lower RDS(ON) MOSFETS (a fancy way of saying lower resistance which translates into lower heat), High ESD (electrostatic discharge) ICs, and even anti-surge ICs to help prevent damage to your board due to power surges from either unclean power or potentially a faulty add-in component. Overall it looks like this is going to be a very impressive lineup. We are looking forward to actually getting one in the lab so we can take a closer look at one (or all) of these boards. For now we have to connect ourselves with the information we have. If you want to check out the fill lineup you can look at Gigabyte’s Z77 page at the link below.